The David Slaton "Assassin" series is set to continue regularly. Assassin's Code was released last August, and Assassin's Run is coming in August 2018 with more to follow. 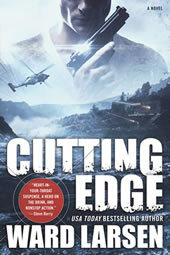 My next book will arrive this January, and it's called Cutting Edge. As the name implies, it's a somewhat futuristic tale, but not as much as most might imagine. Earlier this year, Elon Musk, the entrepenuer behind Tesla and SpaceX, launched a company called Neuralink. Its stated goal is to develop brain-computer interface, which I believe will be the next major innovation to change our lives. Just as few of us could have realized the impact of smartphones twenty years ago, my hero in Cutting Edge, Trey DeBolt, finds himself thrust to the forefront of a new technology--albeit, in his case, with a devastating twist that increases its effectiveness exponentially. I continue to be buoyed by reader support. Thanks for your feedback. Reviews are always appreciated, and please feel free to contact me. Older PostCome See Me At My Next Event!